Pangolins lack teeth in their jaws and are hence not able to chew. Evolution has compensated for thisloss by giving them extremely long tongues. They use their strong claws to break anthills and termite mounds open and can probe deep into these structures for ants and grubs. 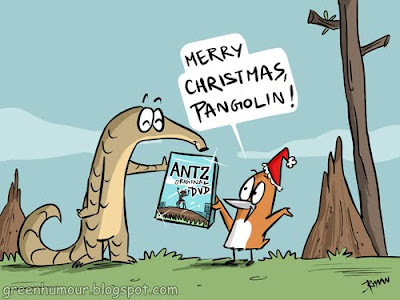 Some species such as the Tree Pangolin use their prehensile tails to hang from branches and hunt arboreal insects. So, what gifts did you give/get this Christmas?